Anyone who’s tried to commit to a health kick knows what we mean. Imagine wilted lettuce, some dry grated carrot, and a couple of chopped cherry tomatoes – that, friends, is salad hell. For the days when you feel like something a little lighter (or if you scoffed a few too many plates of pasta over the weekend), we’ve pulled together Brisbane’s most delicious, unexpected, and filling salads. A westside fave, Corner Store Cafe’s menu features a few unique bangers, like the spiced kangaroo salad with quinoa, tomato, feta, watercress and harissa labneh topped with dukkah and raspberry vinaigrette. Pull up a seat in their blissful outdoor seating area, you’re going to want to savour this one. It can be hard to choose from Vvaldmeer’s entirely house-made menu, but the green papaya salad is the perfect place to start. Choose from fragrant Thai fish cakes or caramelised pork belly or (hot tip) do both! Whichever protein you choose only elevates the delish base of green beans, roasted peanuts, cherry tomatoes, and bean sprouts doused in a hot and sour dressing. 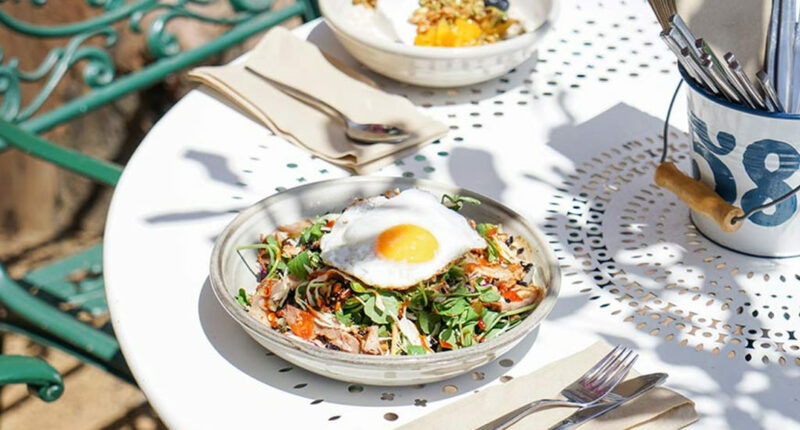 An unexpected breakfast fave, the Asian duck salad at Herston’s Victoria Park Bistro is new to the menu but already pulling some rave reviews! 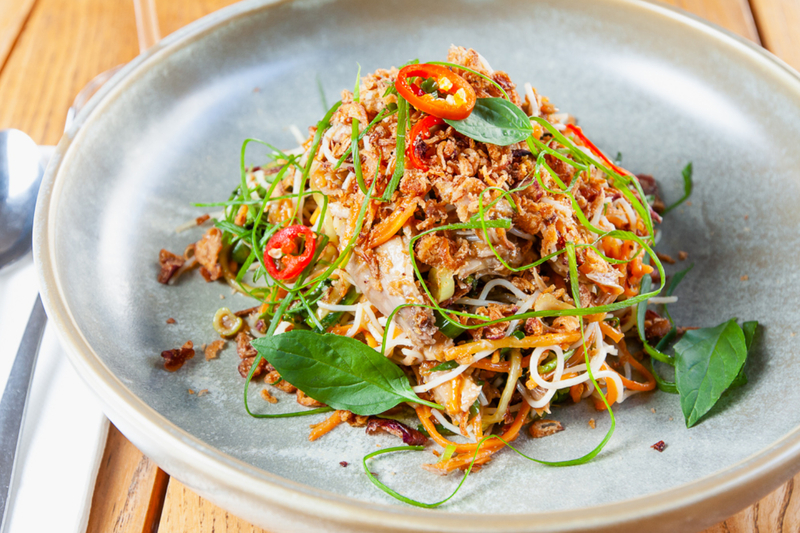 The salad combines juicy duck with snow pea sprouts, toasted rice, peanuts and Korean chilli sauce, topped off with a perfectly soft fried egg – duck yeah! Packed with crunchy peanuts, chilli, and Thai basil, Hello Please’s tom kha gai-style coconut chicken salad is great to share as part of a spread, or smash on its own. With loads of shredded chicken and cooling coconut, it’s a perfect warm weather lunch option. The city’s best worst-kept secret feeds hungry workers with their range of wholesome meals, house-made sweets, and rotating salad bowls. Wander along Burnett Lane to grab a selection of the day’s specials with a slab of sourdough, and add on falafel, kofta, or confit fish to really fill the hole. An absolute must-order on a visit to Longtime, the salad of roast pork belly, charred spring onions, cucumber ribbons, and bean sprouts nestled under an egg net basket is a flavoursome and filling salad that’s been on the menu (in some iteration) since day dot. Head to this Paddington haunt for a refreshing and filling salad featuring their signature middle Eastern flavours. Think red coral lettuce topped with falafel, pickled fennel, pomegranate tahini dressing, and candied sunflower seeds. It may be GF and vegetarian-friendly, but it’s one that’s a winner for all lunch requirements. No need get your head in a spin-ach over summer eats – lettuce try a flavour-packed, colourful salad to keep it flavoursome, fresh and healthy this season. - the gourmand who counts salad as a friend. Looking for a meal that’s healthy, delicious and aesthetically pleasing? Haloumi from the other side!